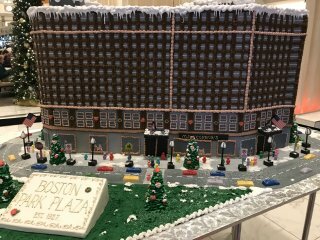 The Boston Park Plaza Hotel offers room service and a restaurant in the lobby called "Off the Common". Inside the hotel on the lobby level are a Starbucks and "Strip by Stega", a high-end steak restaurant. Located within the building, but only accessible by going outside. Hours: Sunday - Saturday: 11:30am - 2am. There are many restaurants in Boston near the hotel. You can ask Yelp for a list of restaurants within a mile of the hotel.